The Science of Hair Biology, Hair Care, Hair Regrowth, and Special Concerns you may have like Beard Growth, Hair Removal, Transplants or Ingrown Hairs. This is our general advice on hair care for women. Many hair products for women cause long term damage. Many hair experts think that women's hair was healthier 100 years ago. Old photographs often show women in the 60s with hair down to their shoulders or their waist. Copper Peptides help supply nutritional copper to the scalp so that the skin can perform its functions. Numerous studies from the US Department of Agriculture Nutrition Laboratories indicate that most persons have an inadequate intake of copper for optimal health. This may help. 1. If your scalp is irritated, then to calm your scalp and help hair growth, the best would be to use the Emu Oil on your scalp in the morning and a Copper Peptide Lotion at night on your scalp in denser hair areas and on hairlines. Start with a very light amount of each. You do not need to wash it out in the morning. 2. If there is no scalp irritation, then use a Copper Peptide Serum on your scalp - a small amount. Let it dry a little, then apply a light amount of Emu Oil. You do not need to wash it out in the morning. 3. If you have very blonde hair, then use a lotion based on tin-peptides but which works better for some individuals. 4. Also take daily supplements of MSM - 2 to 4 grams - and 5 grams each of flaxseed oil. 6. Always use a minimum of shampoo and conditioner. Shampoos and Conditioner with copper peptides help. Always use very mild shampoos that help thicken and keep more moisture on the hair shafts. 8. Stress can cause hair loss. Blood cortisol levels are raised and this inhibits skin repair. Often temporarily taking a daily supplement of 10-15 mgs of DHEA for a month will block the damaging actions of cortisol. 10. MInoxidil and Copper Peptides work well together. Apply the minoxidil and let it dry for a few minutes. Then apply the Copper Peptide product. 11. Products with DHT blockers are often used in hair products for men and may help improve hair quality. 12. Sometimes new hair growth can push out older hair shafts and there may be a brief period of hair shedding as the new hair shafts push out the old dormant hair shafts. Old, non-growing hair is held in the hair follicle for a bout four months before falling out. If you have ever wondered how to to grow long hair faster it is important to also understand how changing hormones, UV Rays, styling agents such as blow dryers or curling irons can affect your hair. 1. DHT (Dihydrotestosterone) accumulation damages follicles due to 5-alpha reductase actions Natural copper ions in are both potent inhibitors of 5-Alpha Reductase Inhibitors to block DHT production. Saw palmetto oil and beta-sitosterol in also inhibit DHT production. 2. Follicle miniaturization produces thin hair Copper peptides increase follicle size and this produces thicker hair. 3. The follicle's cycle of Anagen (growing) to Telogen (dormant) shortens producing smaller follicles Copper peptides increase follicle cell proliferation and decreases programmed cell death of follicles (apoptosis). 4. Inadequate blood vessels to carry nutrients to the follicles Copper peptides help produce new capillaries. 5. Inflammation around follicles causes damage Copper peptides are anti-inflammatories that are as potent as cortisone (and other corticosteroids) but unlike cortisone, do not damage skin. They increase superoxide dismutase and block damage by interleukin-1, TGF-beta 1, and reactive carbonyl species. 6. 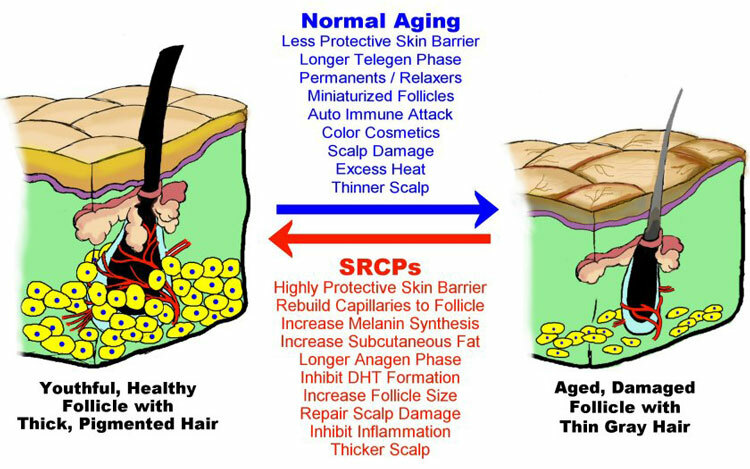 Subcutaneous fat layer diminishes with age Copper peptides increase the subcutaneous fat cells are associated with large, healthy hair follicles providing nutritional support to the follicles. 7. Scalp damage from relaxers, perms, hair dyes, scorching blow dryers and hot oil treatments reduces hair growth Copper peptides help repair scalp damage. 8. Hair eventually grays with age Copper peptides supply copper that tyrosinase needs to produce melanin. What makes your hair grow? Well, when we are young, our scalps and hair follicles are thick and rich. Our follicles have a fertile blood supply and growing healthy hair is not a challenge. However, as we age the processes that regenerate hair follicles slow down. In males, DHT, a hormone that destroys hair follicles, only exasperates the negative impact to hair growth. As our scalp thins with age, its blood supply diminishes and provides less support and nutrition for hair follicles. The sad result is we end up with smaller follicles that produce thin hair shafts. Copper-Peptides (CPs) help improve scalp and hair health by improving follicle vitality. It also helps to block DHT generation in your scalp. Beautiful hair and skin are interconnected in ways many of us may not realize. For the key to remodeling and rejuvenating skin begins with our hair follicles. When the body signals skin to remodel and renew, it begins by enlarging hair follicles. 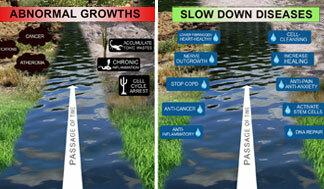 The growing follicles then stimulate new skin cells that proceed to migrate into the surrounding skin. Doctors first observed this migratory effect in their wounded burn patients during World War II. They noticed that hair follicles grew at the edge of the burned skin. If the follicles enlarged, the healing was poor and burn scars remained. Later, in 1985, we found that Copper Peptides not only stimulated the healing of wounds but also increased the size of hair follicles near the injuries. The copper-peptides were not hair growth stimulators, per se, but did increase hair follicle size and vitality. In recent years, it has been established that genetic modifications in mice that stimulate skin remodeling also increase hair follicle size (Fuchs 1998). Genes such as sonic hedgehog (Sato et al 2001, Nanba et al 2003, Oro et al 2003. Mill eta al 2003), catinin (Huelsken 2001, Van Mater et al 2003), Wnt (Stenn 2001) and Noggin (Botchkarev 2001) all enhance hair follicles that produce remodeling. Professor Hideo Uno (who wrote UpJohn's textbook for physicians when Rogaine first was marketed) has found that CPs convert thin, vellus hairs into thick, terminal hairs. (Uno and Kurata 1993, Uno, Packard, Patt 1996). Numerous studies have found such copper-peptides to increase hair follicle size. Also, even modest increases in copper in the skin produces over 90% reductions in the production of DHT, the hair growth inhibiting hormone. Increased tissue copper levels also decrease damaging types of oxidations and protein crosslinking (protein glycation) and raises DHEA levels. CPs have both skin repair and hair growth enhancement effects. The skin of the mouse to the left was shaved, then treated in three spots with CPs. The result is a much more rapid hair growth (the three circular patches of hair) in the three spots treated. While human hair growth will not respond nearly as dramatically as in mice, skin health and hair follicle function are closely interrelated. New skin appears to arise from the hair follicle. As a person ages, our hair follicles get smaller, producing thinner hair shafts. The blood circulation system that supplies nutrients and oxygen to the hair follicle send fewer blood vessels to the hair follicle, thus inhibiting the vital flow of nutrients to the hair follicle. Copper-Peptides complexes improve skin health and a more healthy skin increases the blood vessel network to the hair follicles resulting in larger follicles that grow hair faster with thicker hair shafts. In the microscopic images to the right, the magnifications are identical. 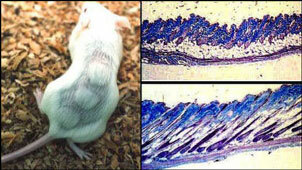 The top photo is mouse skin untreated with CPs. The bottom photo is mouse skin treated with CPs. 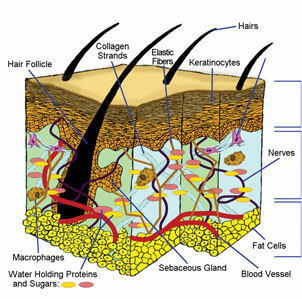 Note the larger hair follicles (the elongated purple columns) in the lower photo, the increased content of subcutaneous fat in the skin (the white material in the center of the skin), and the increased thickness of the skin. When we are young, we have a layer of fat under the skin (part of "baby fat") which is greatly reduced as we age. Hair researchers have noted the accumulation of this fat around healthy follicles that are vigorously growing hair, and its relative lack in around dormant follicles, and have postulated that these cells serve a supportive function for the hair follicle. 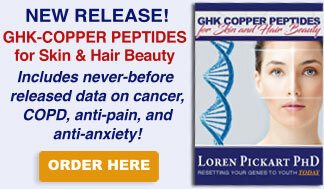 In animal studies, copper peptides have reduced or stopped the hair loss associated with chemotherapy for cancer. It must be emphasized that effects in in humans on hair follicle health are not as dramatic. Is Copper Better Than Propecia® to Block DHT Production? Research indicates that the DHT that harms hair follicles comes from the the skin's sebocytes and sweat glands (sebaceous glands). (Chen et al 1996) 5 alpha-Reductase, the enzyme system that converts testosterone into DHT occurs in two enzyme forms. The type 1 represents the 'cutaneous type'; it is located primarily in the skin's sebocytes but also in epidermal and follicular keratinocytes, dermal papilla cells and sweat glands as well as in fibroblasts. The type 2 is located mainly in the seminal vesicles, prostate and in the inner root sheath of the hair follicle. Propecia® (Finasteride), which has a higher affinity for the type 2 form, is best suited for for controlling prostate enlargement. It also must be administered by pills that spread the drug throughout the body. Copper ion in the skin is more effective in inhibiting the type 1 form which is primarily producing the DHT that damages follicles and can be administered locally to the skin. Sugimoto et al (Sugimito 1995) found that copper ion is a potent inhibitor of 5-alpha reductase, inhibiting both types of 5-alpha reductase (both type 1 and type 2) that produce DHT and is the only metal to do so. Copper ion inhibits (50% reduction in activity) type 1 alpha reductase at 1.9 micromolar (0.12 micrograms copper ion per milliliter) and type 2 alpha reductase at 19.2 microM (1.2 micrograms copper ion per milliliter). No other metal has these effects. The application of CPs may provide sufficient copper ion into the hair follicle area to block DHT production in the scalp. Metabolically active copper ion (that is, copper ion free to block 5-alpha reductase) in the human body exists at about 1 microgram per milliliter in the blood and less in the skin. While the uptake of ionic copper from Copper-Peptides applied to the scalp is very low, human experiments by Professor John Sorenson (University of Arkansas) have found that they can raise copper ion levels in the skin to the effective level of 1 microgram per milliliter. Copper deficiency in animals causes increased cellular oxidation, increased cancer, increased cardiovascular risk, more atherosclerosis, higher LDL-cholesterol, decreased HDL-cholesterol, more lipid oxidation, aortic aneurysms, osteoarthritis, rheumatoid arthritis, osteoporosis, chronic conditions involving bone and connective tissue, brain defects in newborn, obesity, graying of hair, increased sensitivity to pain, obesity, reproductive problems, and speeds the development of Alzheimer's plaques. See more below. In humans, copper deficiency is associated with all of the previous plus depression, impaired brain function, and general fatigue. Copper is usually in short supply in the body and high zinc usage drives copper from the body and can produce copper deficiency. Studies have found that ionic zinc can inhibit 5-alpha reductase (type I) but zinc has no effect on type II reductase. Some studies have found that the combination of B6, zinc salts and azelaic acid, even at low concentrations, caused a 90% inhibition of 5-alpha reductase activity - but this is still not hair growth. In some persons zinc salts are often used in disorders related to excess DHT such as acne and prostrate hyperplasia. The topical application of zinc has shown to reduce sebum production and acne. Some people suffering from acne have been found to have zinc deficiencies in their skin, despite of the fact that they have normal levels within their bloodstream. The effects of topical zinc on hair growth may be due to skin irritation actions. In the 1970's, a number of severe skin irritants, such as nitrobenzene derivatives, were investigated for hair growth properties. While they initially stimulated hair growth, they ultimately produced unacceptable scalp damage and irritation and could not be continued for use. Zinc salts can inhibit the action of the immune system macrophages on the skin. Since the macrophages are key cell responsible for skin repair, excessive use of zinc salts on the skin could inhibit skin and hair follicle repair. Mulhern et al 1986 reported that excessive dietary zinc in mice reduced plasma copper and induced alopecia. Lansdown 1991 (Westminster Medical School, Department of Comparative Biology, London, UK) examined the dermal irritancy of six zinc compounds was examined in three animal models. In open patch tests involving five daily applications, zinc chloride (1% aqueous solution) was severely irritant in rabbit, guinea-pig and mouse tests, inducing epidermal hyperplasia and ulceration; aqueous zinc acetate (20%) was slightly less irritant. Zinc oxide (20% suspension dilute Tween 80), zinc sulphate (1% aqueous solution) and zinc pyrithione (20% suspension) were not overtly irritant, but induced a marginal epidermal hyperplasia and increased hair growth. Like zinc, topical cortisone has been used to promote hair growth and is often reasonable effective in persons with inflammatory scalp conditions. But comes at the potential cost of a permanently thinned and damaged scalp. If cortisone is used for an extended period, it may damages hair follicles and cause hair loss. 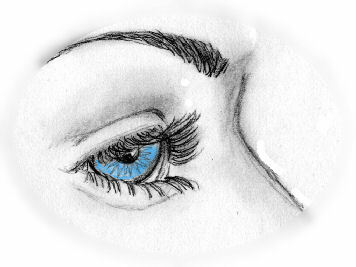 The loss of eyebrows and eyelashes is often due to long-term use of cosmetics. At times, copper peptides can help to restore eyebrow and eyelash health and appearance. This takes about two months. 1. Each day, lightly apply a copper peptide cream. Massage in. 2. Then use a light application of a hair-healthy biological oil such as emu oil. 1. Apply a light coating of a copper peptide cream directly on the skin below or above the eyelashes near the eyelash bed (where the eyelashes would protrude from). 2. Perhaps follow with a light application of a biological healing oil. Be careful oil does not transfer into the eyes.